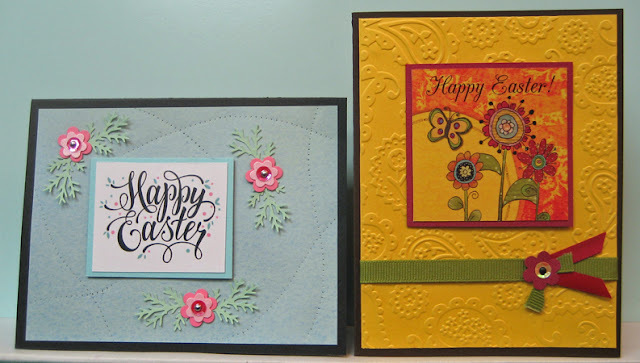 I started with a very elegant digital Easter greeting which I laser printed, trimmed and layered onto coordinating cardstock. I found a piece of coordinating scrapbook paper and glued it to my black card front. I used punches to create these little flower embellishments to finish off my card. I used silver brads to combine a pink sequin, a light pink and a dark pink flower punchie. I punched some light green feathery leaves (MS) and adhered them to the back of my flowers using double sided tape. I glued my focal element to my card front and then glued the flowers around it. It still needed a bit of something so I used my pattern tracing wheel to add some paper piercing to the card front in between my elements. I was careful to not pierce too deep as to not damage my black card front and I think it adds a lot of interest and texture to my card!! Perfect!! For my second cards I started with this very bright floral digital image (Pixabay) to which I added a font greeting before laser printing it. I layered it onto dark pink cardstock and went looking for a coordinating piece for my background. I found this beautiful yellow piece, embossed it and added the green gros grain ribbon before I mounted this large element to a dark brown card. I mounted my focal element above the ribbon and thought that it needed just a bit of something so I created a little flower 3D embellishment that coordinated. I used a dark brad and layered on a yellow sequin, a dark pink flower punchie and added ribbon leaves to the back using double sided tape. I cut a piece of dark pink ribbon, folded it and used the brad from the flower to adhere it to my card front over the green ribbon. That worked very well! !